They’ve “put John to sleep”? They put John to sleep when they exited the Soul World so he would think it was all a dream, wouldn’t have to involve him, and subsequently not have to bring him back into the Soul World. We know, Loco. He was making a joke. He’s jelous…of spiders. That’s just…wow. I have nothing to describe how wierd that is, and considering what I came up with for Anabel, that says somthing. 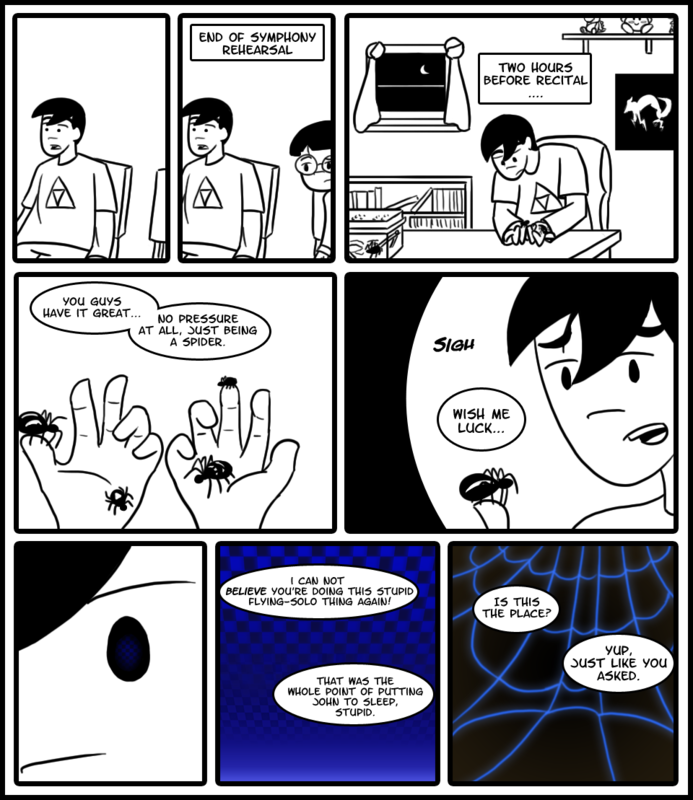 In this regard the fact that his pets are spiders specifically isn’t as significant to the sentiment of this page. Just that they’re animals/pets in general. Although yes, spiders does give this page a very different feel than if he was talking to a dog or cat, and that is of course intentional. This plot development is completely lame but that’s okay because Metal Gear. Eh, spiders aren’t that wierd. One of my friends keeps 5 snakes, 1 tarantula, 1 scorpion, 5 Rats, 3 lizards, 2 hamsters, adn 4 cats as pets. Oh, and he just got a new kitten. And this is AFTER he gave away some of his pets to others because it was starting to become hard to care for them all. Eric just has a spider fetish.